Thankfully, Panama has never been hit by a hurricane. Tropical storms, yes. But hurricanes, no. Recently, Hurricane Florence hit the US coast. As usual, post-hurricane, people emailed us about hurricanes in Panama. So today, I am revisiting what I wrote 3 or 4 years ago about hurricane activity in Panama. “No. 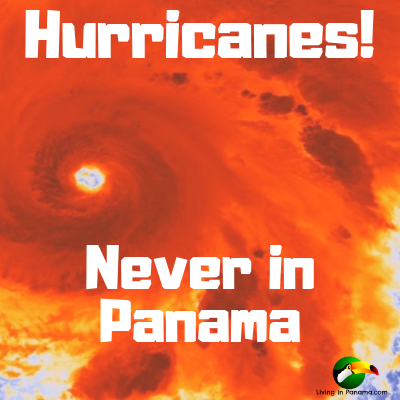 There are still no hurricanes in Panama”. In fact, there has never been a recorded landfall of a hurricane on the isthmus of Panama, Central America. However, back in 1969, Hurricane Martha, with winds up to 90mph, was sighted 100 miles off the Atlantic coast of the Veraguas Province of Panama. This category 1 (1 is the weakest, 5 is the strongest) hurricane weakened to a “tropical storm” with winds below 50mph before it finally made landfall in a rural part of Veraguas and quickly died out. There was no significant impact on the human population. That’s about it, as far as hurricane activity in Panama is concerned. As for more current weather events, on a Tuesday in August of this year (2018), we experienced high winds in Puerto Armuelles. That night wind gusts of 30-35 miles per hour toppled trees around Puerto Armuelles and caused residents to be without electricity. Most areas only lost electricity overnight, a few areas were without power for a day or two, and in the beach neighborhoods of Corazon de Jesus and further out for a few days. We had to hire a neighbor with a chainsaw for a couple of hours the following day, to remove one fallen tree from the roadway into Corazon de Oro. That was the extent of the damage to our property. This windstorm encouraged me to have some preventative pruning done to other trees, which were overgrown, or posed a risk to power lines or fences. Some areas of Panama are prone to heavy tropical rains during the rainy season. Generally, these do not affect normal human activities. However, in places like Panama City, where rapid development has outpaced the municipal infrastructure, flooding can be problematic from time to time. We have never seen this first hand, we have only read about it in the paper. In the Chiriqui Province, there are places with heavy rains, and on rare occasions, there may be a temporary road closure due to flooding. On one particularly stormy November night about 6 years ago, we were driving from David to Panaso Canoas in knee-high in water. The flooding occurred due to the culverts being clogged by a recent mowing of nearby vegetation. That night, soon after we crossed it, a bridge went out. No one was hurt. One of the most dangerous places on earth for Hurricanes continues to be the southern and eastern coasts of the United States. The “Sunshine State” of Florida is one of the worst for Hurricanes. It is the worst on all counts: frequency, strength, duration, and damage to property. As I’ve said, Panama City, Panama (and all of Panama) has never had a Hurricane. Meanwhile, it’s namesake, Panama City, Florida, has the nickname “Hurricane City”. Panama City, Florida has had a constant barrage of Hurricanes and tropical storms batter its beaches over the years. In fact, since records of hurricane activity have been kept beginning in 1871, Panama City, Florida has been hit by 60 hurricanes or major tropical storms. That is a major weather event every 2.43 years, with a Hurricane every 8 years. The next predicted hurricane in Panama City, Florida is expected within this very hurricane season, which ends this month. That is too much hurricane activity for me, but I am a bit of a worrier. If you were to look at a map of major Hurricane activity in this hemisphere, the map would look like a map of the southeastern United States. To be precise, Florida, Louisiana Mississippi, Georgia, Texas, North and South Carolina, Virginia, Maryland, Delaware, New Jersey, New York, etc all the way up to Maine. All of these areas are far more vulnerable to hurricanes than the Republic of Panama. Get news on living in Panama. Sign up for our monthly newsletter today.